On February 11, Academic Computing and Instructional Technology Services (ACITS) hosted an open house for the new University of Redlands Makerspace. A space that emphasizes learning by doing, the Makerspace is home to two 3D printers and a scanner, virtual (VR) and augmented reality (AR) headsets, and other technologies that encourage students, faculty, and staff to invent and create. Makerspaces are communal workspaces that enable technology-based and engineering-oriented projects in robotics, electronics, art, and other disciplines, resulting in immersive learning. Maker technologies facilitate collaboration among people with different backgrounds, and the U of R Makerspace—made possible by the support of Lockton Companies—echoes the University’s mission to provide students with an interdisciplinary and experiential education. 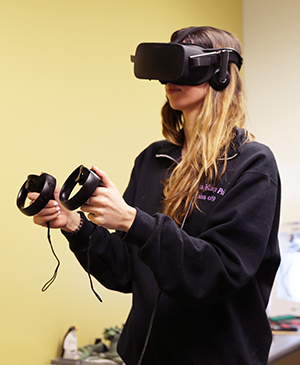 Sabrina Scoggin ’19 demonstrates an Oculus Rift headset in the Makerspace, which will host a monthly virtual reality special. (Photo by Greta Jursch ’21). 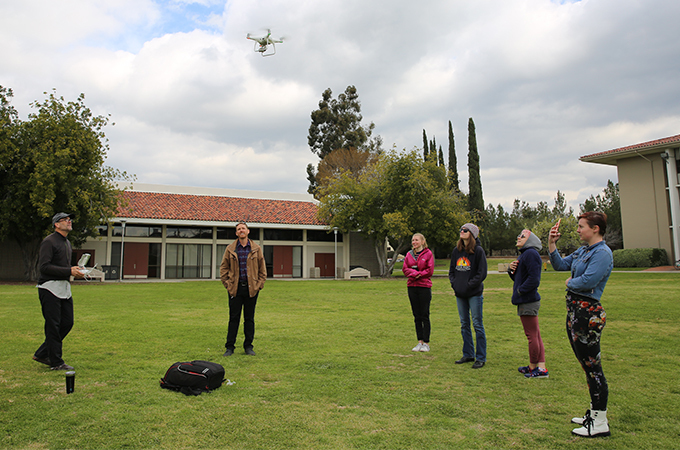 Additionally, Professor of Studio Art Raúl Acero has been working with his students to use those same drone-generated models to evaluate the impact of their sculptures in different environments on campus. Once a suitable location is determined, a mock-up will be created with a 3D printer to help students envision the final form of the piece. In other projects, students have used Oculus Rift headsets to virtually visit the Salton Sea before taking a field trip to the actual site, peruse Mecca via Google Earth during a First-Year Seminar, and print items in 3D to model a potential Joshua Tree campsite. In addition to the Makerspace’s virtual reality headsets and 3D printing and scanning capabilities, the facility provides access to the platform Nintendo Labo, a do-it-yourself kit with a basic programming feature, and a Raspberry Pi, a small single-board computer that teaches users the foundations of computer coding languages. Iyan (who asked the blog to use his first name) says the Makerspace will host a monthly VR special to encourage students to use it to experience different environments. The current VR special is titled “I Am a Man” and enables users to witness the 1968 Memphis sanitation strike from the perspective of a striking worker marching through the streets.